Instow Picture Tour. 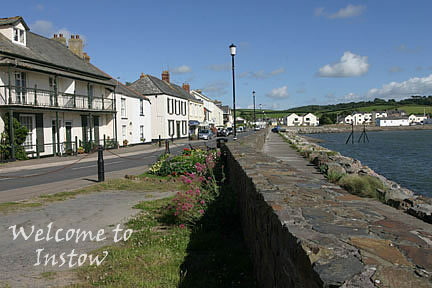 Instow, "Where the Taw meets the Torridge"
The delightful village of Instow has been welcoming visitors since Victorian times. It lies at the confluence of two rivers The Taw and The Torridge. With its superb beach and colourful Regency style terraced houses it is easy to see why it is still popular today. If you are travelling by car it is half way between Bideford and Barnstaple on the B3233. If you are walking or cycling on the Tarka Trail we recommend you step over the tracks and rest a while. There are places to stay, inns, cafes and restaurants a-plenty, a supermarket, a post office, giftshops and galleries. The long established Waterside Gallery which closed a couple of years ago, held regular exhibitions and also had local artists work on display. From the Instow Signal Box, which is one of the smallest listed buildings, make your way along the Quay. Over the new quay wall you can see the old Railway Station, now home to the North Devon Yacht Club, Appledore Shipyard is on the opposite bank with Bideford just in sight upriver. In the Summertime, if the tide was right, you could take the ferry over to Appledore from the jetty by the Round House. The ferry service that had existed between Appledore and Instow for more than two centuries was withdrawn in September 2007 but was happily reinstated in 2011. The new Appledore to Instow Ferry now runs daily from April until the end of October. The very first ferry ran from Braunton in 1639. The interesting artwork on the wall by the boat park is the "Leaping Salmon" Willow Sculpture designed by the children of Instow Primary School for "Instow in Bloom". Many of the terraced houses have brightly painted wooden shutters, a great advantage on wild and windy days. The new apartments were built on the site of the old Marine Hotel. 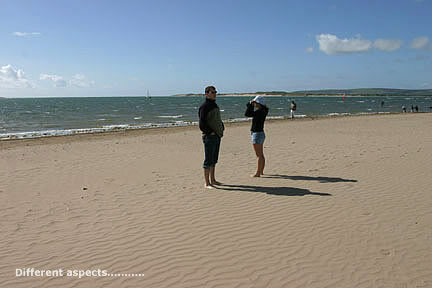 As Instow beach comes into view you can now appreciate why it is so popular. Golden sands as far as the eye can see with stunning views across the estuary to Appledore, Crowe Point and Braunton Burrows. Even on a calm day, if the tide is coming in, the white waters of the Atlantic Ocean can be seen pounding over the famous Bideford Bar. It is easy to understand how even the most experienced seafarers flounder here and why Appledore, Bideford and Instow were regularly flooded. In 1992 work was completed on the Instow Flood Defence Scheme which enhanced the Quay from the jetty to the entrance of the Yacht Club raising the existing sea walls by 0.5 metres. The village celebrated the completion with a street party. There are grand houses set back from the road all the way along Marine Parade, the elegant Commodore Hotel has won many awards for its Cream Teas and is a popular location for special occasions and wedding receptions. At high tide the estuary is a hive of activity. Boats of all shapes and sizes with or without sails can be seen just bobbing or darting to and fro. It is not always plain sailing for wind-surfers who constantly fight the elements and their equipment resulting in regular spills and more time spent in the water than on it! All this action is great entertainment for those who prefer to take in the sea air at an easier pace; be very lazy sit on the promenade and just chill or wait for one of Instow's glorious sunsets. The beach, high tide or low, is always fun for everyone, perfect for a game of cricket or volleyball, building sandcastles, beach combing or a bracing walk. At the end of Marine Parade are the sandhills. The main car park is here. The North Devon Cricket Club, which celebrated its 175th Anniversary in 1998 is close by. The thatched Club House and Score Box were presented to the club in 1949. You can rejoin the Tarka Trail through a small walkway then continue on by Isley Marsh Nature Reserve on Instow's eastern border, past the site of the old Power Station at Yelland, onwards to Fremington Quay and Barnstaple. Instow Parish rises up from the foreshore to Worlington. Instow Church is positioned high on the hillside. 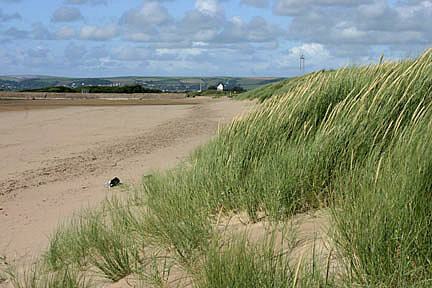 The beach at Instow and farms on the uplands are owned by the Christie Estates together with the freehold of much of the land in the parish. The entrance to Tapeley Manor is on the B3233 just past the Westleigh signpost if you are travelling from Bideford so while you are here make sure you visit Tapeley Park Gardens which are open everyday except Saturday from March to the end of October. The annual Appledore /Instow Regatta Gig races are held in August. For more information on Instow and its history we recommend you read all about it in the book "Instow a History" which was voted Devon Book of the Year by the Devon History Society. The book was a community project for the Millenium co-ordinated by local historian Alison Grant. Isley Marsh Nature Reserve has been designated a Site of Special Scientific Interest because of number of wildfowl and wading birds that use the estuary during the winter.